You'll be £11.99 closer to your next £10.00 credit when you purchase The Battle for Arnhem 1944-1945. What's this? Operation Market Garden, September 1944, the Netherlands. Three parachute drops and one armoured charge. The prize was the last bridge at Arnhem over the Neder Rijn. Taken intact it would provide the Allies with a back door into Germany – the famous ‘Bridge Too Far’. This was one of the most audacious and imaginative operations of the war, and it failed, and Anthony Tucker-Jones’s photographic history is a vivid introduction to it. In a sequence of almost 200 archive photographs accompanied by a detailed narrative he describes the landing of British and American parachutists and glider troops. At the same time British tanks spearheaded a sixty-mile dash along ‘Hell’s Highway’ to link up with the lightly armed and heavily outnumbered airborne forces. Most books about the resulting battle concentrate on the struggle at Arnhem and the heroism of the British 1st Airborne Division. This book puts that episode in its wider context. In particular it focuses on the efforts of the US 101st and 82nd airborne divisions to hold off counterattacks by German battlegroups during the tanks’ advance. The photographs give a dramatic insight into all sides of a remarkable but ill-fated operation which has fascinated historians and been the subject of controversy ever since. They also portray, as only photographs can, the men who were involved and the places and conditions in which the fighting took place. Here, photographs complied by historian Anthony Tucker-Jones, shows how the Allies's plan came undone and the Germans showed, despite their defeat on D-Day, that they were still a force to be reckoned with. 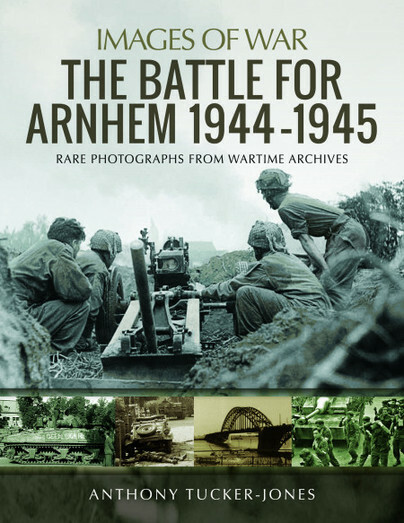 This book in the excellent ‘Images of War’ series delivers a good narrative of the Arnhem operation coupled with good photographs illustrating the battle. The maps are excellent and support the outline description of the events. A good introduction to the Market Garden operation or a worthwhile supplement to more detailed examinations that might already be on your library shelf.